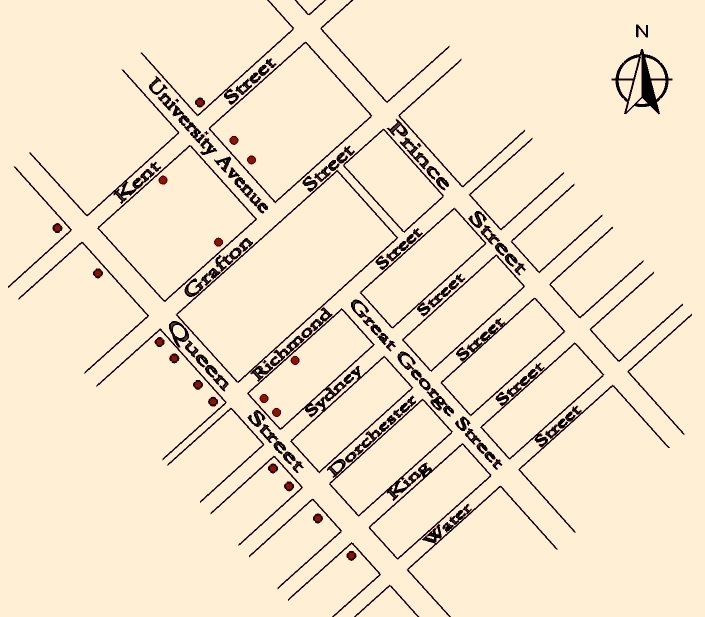 Dizzy Block, Sunnyside, downtown or Old Charlotte Town have been some of the ways used to describe the City’s commercial areas south of Euston Street. In the past, almost everything you needed could either be produced in your household, or purchased at one of the many downtown shops. It was not only the retail centre, but a place where citizens gathered to catch up on the news (gossip) at Apothecaries Hall corner, enjoy a beverage at a local establishment (legal and illegal), or in the case of Dizzy Block, to see and be seen. Countless parades have wound through the area and visiting dignitaries were often feted with large ceremonial arches that spanned the width of the street. Although some things have changed, the downtown is still vibrant. An exhibit entitled Celebrate Mainstreet: Its Rich History – Its Vibrant Future was featured in the windows of participating businesses in February and March of 2015 along the following route. We decided to feature the exhibit on this site for those that missed the opportunity to view it. Each section describes a specific mainstreet area of the City so it is like you are taking a tour of the Exhibit, without leaving your house. If you would like to share your story about the downtown, we would love to hear it. You can share it in the comments section below or click the contact us link above.